This article is about the Ukrainian autonomous republic that was annexed in 2014. For the Russian federal subject, see Republic of Crimea. The Autonomous Republic of Crimea (Ukrainian: Автономна Республіка Крим, translit. Avtonomna Respublika Krym; Russian: Автономная Республика Крым, translit. Avtonomnaya Respublika Krym; Crimean Tatar: Qırım Muhtar Cumhuriyeti, Къырым Мухтар Джумхуриети or Ҡырым Мухтар Җумхуриети) is, de jure, an autonomous republic of Ukraine encompassing most of Crimea, though, de facto, it was annexed by Russia and incorporated as a Russian federal subject - the Republic of Crimea - in 2014. Crimea was previously under Russian control from 1783 until 1954 (punctuated by short periods during political upheavals and wars), when it was transferred, within the USSR, to the Ukrainian SSR. Later, following a referendum on 20 January 1991, the results of the pro-independence referendum were discarded and it became an autonomous republic within the Ukrainian SSR. When the Soviet Union collapsed in 1991 and Ukraine became an independent country, Crimea remained part of the newly independent Ukraine. In February 2014, following the 2014 Ukrainian revolution that ousted the Ukrainian President, Viktor Yanukovych, pro-Russian separatists and Russian Armed Forces took over the territory. A controversial Crimea-wide referendum, unconstitutional under the Ukrainian and Crimean constitutions, was held on the issue of reunification with Russia which official results indicated was supported by a large majority of Crimeans. Russia formally annexed Crimea on 18 March 2014, although the annexation is not recognized internationally. 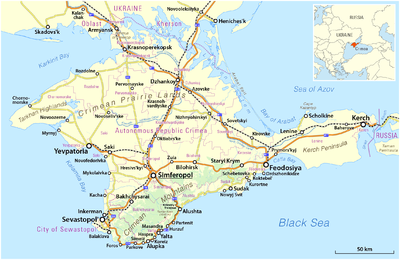 Following a referendum on 20 January 1991 in which over 94% backed the proposal, the Crimean Oblast was upgraded to the status of an autonomous republic on 12 February 1991 by the Supreme Soviet of the Ukrainian SSR. 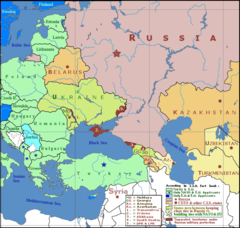 When the Soviet Union collapsed and Ukraine became an independent country, Crimea remained a republic within the newly independent Ukraine leading to tensions between Russia and Ukraine as the Black Sea Fleet was based on the peninsula. On 26 February 1992, the Crimean parliament renamed the ASSR the Republic of Crimea. It then proclaimed self-government on 5 May 1992 with a referendum, for approval, planned for the August (which, in the event, was never conducted) and also passed the first Crimean constitution. The following day, the same parliament inserted a new sentence into this constitution that declared that Crimea was part of Ukraine and then, on 19 May, it annulled its proclamation of self-government after the Ukrainian government expanded on the republic's already extensive autonomous status. :587 The following year, on 14 October 1993, the Crimean parliament established the post of President of Crimea. On 17 March 1995, the parliament of Ukraine abolished the Crimean Constitution of 1992, all the laws and decrees contradicting those of Kiev, and also removed Yuriy Meshkov, the then President of Crimea, along with the office itself. After an interim constitution, the 1998 Constitution of the Autonomous Republic of Crimea was put into effect, changing the territory's name to the Autonomous Republic of Crimea. Following the ratification of the May 1997 Russian–Ukrainian Friendship Treaty, in which Russia recognized Ukraine's borders and sovereignty over Crimea, international tensions slowly eased. However, in 2006, anti-NATO protests broke out on the peninsula. In September 2008, the Ukrainian Foreign Minister Volodymyr Ohryzko accused Russia of giving out Russian passports to the population in Crimea and described it as a "real problem" given Russia's declared policy of military intervention abroad to protect Russian citizens. On 24 August 2009, anti-Ukrainian demonstrations were held in Crimea by ethnic Russian residents. Sergei Tsekov (of the Russian Bloc and then deputy speaker of the Crimean parliament) said then that he hoped that Russia would treat Crimea the same way as it had treated South Ossetia and Abkhazia. The 2010 Ukrainian–Russian Naval Base for Natural Gas treaty extended Russia's lease on naval facilities in Crimea until 2042, with optional five-year renewals. Geopolitics of Crimea, March 2014. Crimea voted strongly for the pro-Russian Ukrainian President Viktor Yanukovych and his Party of Regions in presidential and parliamentary elections, and his ousting on 22 February 2014 during the 2014 Ukrainian revolution was followed by a push by pro-Russian protesters for Crimea to secede from Ukraine and seek assistance from Russia. Four days later, thousands of pro-Russian and pro-Ukraine protesters clashed in front of the parliament building in Simferopol. On 28 February 2014, Russian forces occupied airports and other strategic locations in Crimea though the Russian foreign ministry stated that "movement of the Black Sea Fleet armored vehicles in Crimea (...) happens in full accordance with basic Russian-Ukrainian agreements on the Black Sea Fleet". Gunmen, either armed militants or Russian special forces, occupied the Crimean parliament and, under armed guard with doors locked, members of parliament elected Sergey Aksyonov as the new Crimean Prime Minister. Aksyonov then said that he asserted sole control over Crimea's security forces and appealed to Russia "for assistance in guaranteeing peace and calmness" on the peninsula. The interim Government of Ukraine described events as an invasion and occupation and did not recognize the Aksyonov administration as legal. Ousted Ukrainian President Viktor Yanukovich sent a letter to Putin asking him to use military force in Ukraine to restore law and order and, on 1 March, the Russian parliament granted President Vladimir Putin the authority to use such force. Three days later, several Ukrainian bases and navy ships in Crimea reported being intimidated by Russian forces and Ukrainian warships were also effectively blockaded in Sevastopol. On 6 March, the Crimean Parliament asked the Russian government for the region to become a subject of the Russian Federation with a Crimea-wide referendum on the issue set for 16 March. The Ukrainian government, the European Union, and the US all challenged the legitimacy of the request and of the proposed referendum as Article 73 of the Constitution of Ukraine states: "Alterations to the territory of Ukraine shall be resolved exclusively by an All-Ukrainian referendum." International monitors arrived in Ukraine to assess the situation but were halted by armed militants at the Crimean border. On 6 and 7 March, Russian forces scuttled the Russian cruiser Ochakov and a diving support vessel across the entrance channel to Donuzlav Lake to blockade Ukrainian navy ships in their port. The day before the referendum, Ukraine's national parliament voted to dissolve the Supreme Council of Crimea as its pro-Moscow leaders were finalising preparations for the vote. The 16 March referendum required voters to choice between "Do you support rejoining Crimea with Russia as a subject of the Russian Federation?" and "Do you support restoration of the 1992 Constitution of the Autonomous Republic of Crimea and Crimea's status as a part of Ukraine?" There was no option on the ballot to maintain the status quo. However, support for the second question would have restored the Republic's autonomous status within Ukraine. The official turnout for the referendum was 83%, and the overwhelming majority of those who voted (95.5%) supported the option of rejoining Russia. However, a BBC reporter claimed that a huge number of Tatars and Ukrainians had abstained from the vote. Ukraine, meanwhile, continues to claim Crimea as its territory and in 2015 the Ukrainian parliament designated 20 February 2014 as the (official) date of the start of "the temporary occupation of Crimea." On 27 March 2014 100 United Nations member states voted for United Nations General Assembly Resolution 68/262 affirming the General Assembly's commitment to the territorial integrity of Ukraine within its internationally recognized borders while 11 member states voted against, 58 abstained and 24 member states absented. Since then 6 countries (Cuba, Nicaragua, Venezuela, Syria, Afghanistan, and North Korea) have publicly recognized Russia's annexation of Crimea while others have stated support for the 16 March 2014 Crimean referendum. Executive power in the Autonomous Republic of Crimea was exercised by the Council of Ministers of Crimea, headed by a Chairman, appointed and dismissed by the Supreme Council of Crimea, with the consent of the President of Ukraine. The Mejlis of the Crimean Tatar People was not an official body but could address grievances to the Ukrainian central government, the Crimean government, and international bodies. The Autonomous Republic of Crimea had 25 administrative areas: 14 raions (districts) and 11 mis'kradas and mistos (city municipalities), officially known as territories governed by city councils. ^ In 2015 the Ukrainian parliament officially set 20 February 2014 as the date of "the beginning of the temporary occupation of Crimea and Sevastopol by Russia." ^ (Also) on 24 March 2014, the Ukrainian Ministry of Defense stated that approximately 50% of the Ukrainian soldiers in Crimea had defected to the Russian military. ^ "Treaty to accept Crimea, Sevastopol to Russian Federation signed". Russia Today. 18 March 2014. ^ Chisholm, Hugh, ed. (1911). "Crimea" . Encyclopædia Britannica. 7 (11th ed.). Cambridge University Press. pp. 449–450. ^ "'The Gift of Crimea'". www.macalester.edu. Retrieved 6 March 2014. ^ 'Подарунок Хрущова'. Як Україна відбудувала Крим (in Ukrainian). Istpravda.com.ua. Retrieved 28 February 2014. ^ Calamur, Krishnadev (27 February 2014). "Crimea: A Gift To Ukraine Becomes A Political Flash Point". NPR. Retrieved 27 September 2017. ^ Wolczuk, Kataryna (31 August 2004). "Catching up with 'Europe'? Constitutional Debates on the Territorial-Administrative Model in Independent Ukraine". Taylor & Francis Group. Retrieved 16 December 2006. Wydra, Doris (11 November 2004). "The Crimea Conundrum: The Tug of War Between Russia and Ukraine on the Questions of Autonomy and Self-Determination". International Journal on Minority and Group Rights. 10 (2): 111. doi:10.1163/157181104322784826. ^ a b Belitser, Natalya (20 February 2000). "The Constitutional Process in the Autonomous Republic of Crimea in the Context of Interethnic Relations and Conflict Settlement". International Committee for Crimea. Retrieved 22 September 2017. ^ Cheney urges divided Ukraine to unite against Russia 'threat Archived 21 May 2011 at the Wayback Machine. Associated Press. 6 September 2008. ^ Kuzio, Taras (8 February 2007). "Ukraine: Kiev fails to end Crimea's ethnic tentions" (PDF). Oxford Analytica. Archived from the original (PDF) on 24 July 2011. Retrieved 13 February 2017. ^ Kuzio, Taras. "Separatists and Russian nationalist-extremist allies of the Party of Regions call for union with Russia" (PDF). KyivPost. Archived from the original (PDF) on 16 May 2014. Retrieved 13 February 2017. ^ Levy, Clifford J. (28 August 2009). "Russia and Ukraine in Intensifying Standoff". Nytimes.com. Retrieved 28 February 2014. ^ "Putin orders military exercise as protesters clash in Crimea". Russia Herald. 27 February 2014. Archived from the original on 27 February 2014. Retrieved 22 September 2017. ^ "This is what it looked like when Russian military rolled through Crimea today (VIDEO)". UK Telegraph. Retrieved 28 February 2014. ^ "Movement of Russian armored vehicles in Crimea fully complies with agreements – Foreign Ministry". Russia Today. 28 February 2014. Retrieved 1 March 2014. ^ Shuster, Simon (10 March 2014). "Putin's Man in Crimea Is Ukraine's Worst Nightmare". Time. Retrieved 8 March 2015. Before dawn on Feb. 27, at least two dozen heavily armed men stormed the Crimean parliament building and the nearby headquarters of the regional government, bringing with them a cache of assault rifles and rocket propelled grenades. A few hours later, Aksyonov walked into the parliament and, after a brief round of talks with the gunmen, began to gather a quorum of the chamber's lawmakers. ^ Charbonneau, Louis (28 February 2014). "UPDATE 2-U.N. Security Council to hold emergency meeting on Ukraine crisis". Reuters. Retrieved 28 February 2014. ^ Radyuhin, Vladimir (1 March 2014). "Crimean PM claims control of forces, asks Putin for help". Chennai, India. The Hindu. Retrieved 1 March 2014. ^ "Ukraine army on full alert as Russia backs sending troops". BBC.com. 1 March 2014. Retrieved 1 March 2014. ^ "Yanukovich sent letter to Putin asking for Russian military presence in Ukraine". RT.com. 3 March 2014. Retrieved 27 September 2017. ^ Smale, Alison; Erlanger, Steven (1 March 2014). "Kremlin Clears Way for Force in Ukraine; Separatist Split Feared". New York Times. Retrieved 1 March 2014. ^ "'So why aren't they shooting?' is Putin's question, Ukrainians say". Kyiv Post. 4 March 2014. Retrieved 4 March 2014. ^ "Ukraine resistance proves problem for Russia". BBC Online. 4 March 2014. Retrieved 4 March 2014. ^ "'another view of the Ochakov – scuttled by Russian forces Wed night to block mouth of Donuzlav inlet". Twitter@elizapalmer. 6 March 2014. Retrieved 6 March 2014. ^ "'Ukraine crisis: Crimea parliament asks to join Russia". BBC.com. 6 March 2014. Retrieved 6 March 2014. ^ "'Ukraine crisis: 'Illegal' Crimean referendum condemned". BBC.com. 6 March 2014. Retrieved 6 March 2014. ^ "'Constitution of Ukraine – Title III". Government of Ukraine. Retrieved 6 March 2014. ^ "Russians Scuttle Another Ship to Block Ukrainian Fleet". Ukrainian Pravda. 7 March 2014. Retrieved 7 March 2014 – via iwpr.net. ^ "'Приложение 1 к Постановлению Верховной Рады Автономной Республики Крым от 6 марта 2014 года No 1702-6/14" (PDF). www.rada.crimea.ua. 7 March 2014. Retrieved 7 March 2014. ^ Gorchinskaya, Katya (7 March 2014). "Two choices in Crimean referendum: yes and yes". Kyiv Post. Retrieved 22 September 2017. ^ Sasse, Gwendolyn (3 March 2014). "Crimean autonomy: A viable alternative to war?". The Washington Post. Retrieved 27 September 2017. ^ "Crimea referendum: Voters 'back Russian union'". BBC.co.uk. 16 March 2014. Retrieved 16 March 2014. ^ "Ukraine crisis: Do Crimea referendum figures add up?". BBCco.uk. 17 March 2014. Retrieved 17 March 2014. ^ "Kremlin: Crimea and Sevastopol are now part of Russia, not Ukraine". CNN. 18 March 2014. Retrieved 18 March 2014. ^ "Ukraine: Putin signs Crimea annexation". BBC.co.uk. 21 March 2014. Retrieved 21 March 2014. ^ Ziad, Waleed; Laryssa Chomiak (20 February 2007). "A lesson in stifling violent extremism". CS Monitor. Retrieved 26 March 2007. ^ Автономна Республіка Крим [Autonomous Republic of Crimea]. Verkhovna Rada of Ukraine (in Ukrainian). Archived from the original on 1 October 2007. Retrieved 23 February 2007. Subtelny, Orest (2000). Ukraine: A History. University of Toronto Press. p. 78. ISBN 0-8020-8390-0. Series about the recent political history of Crimea by the Independent Analytical Centre for Geopolitical Studies "Borysfen Intel"
This page was last edited on 21 April 2019, at 19:27 (UTC).